A interactive repl for node, inspired by pry. You MUST name the variable pry. You are executing an anonymous function, and this assumes the variable is named pry in your scope. This is so it can keep prompting you. help display all the available commands. kill completely stop the script. 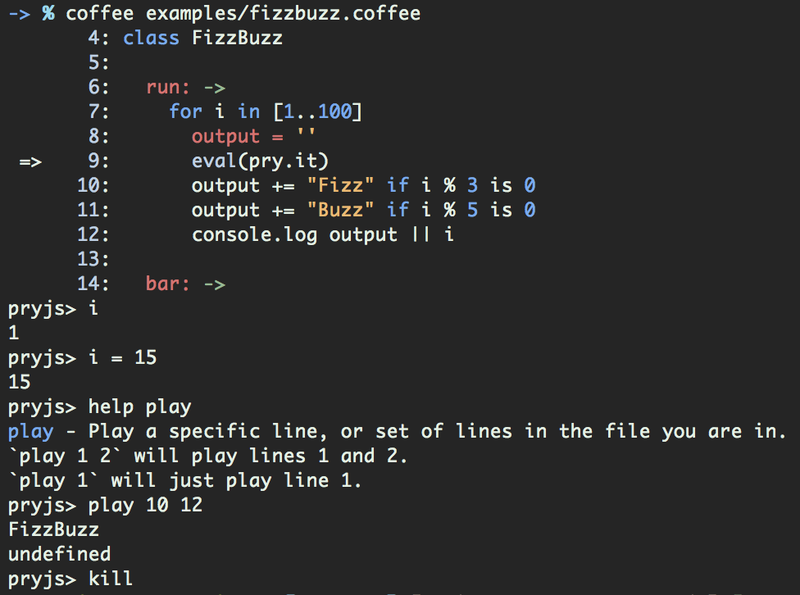 play play lines of code as if you had entered them. Accepts two integers: start and end. End defaults to start. stop will exit the pryjs prompt and continue through the app. version display the current version. whereami will show you exactly where you are in the code. Accepts two integers to replace the default 5 before and 5 after. wtf display the last caught exception.